Analyst firm Next Up Research has published an extensive report on Linden Lab, the San Francisco company behind virtual world Second Life. The research is based on aggregate data and is available on SharesPost, a site set up to trade shares of privately held companies (if you register, you can download the report for free from that page, or you can find other valuation reports on companies like Facebook and LinkedIn). The report goes rather deep into the valuation of the Linden Lab, which it pegs at somewhere between $658 million and 700 million. Now that Linden Lab has been around for nearly 10 years, and with its product Second Life celebrating its sixth birthday since launching publicly in June 2003, we thought it would be a good idea to take a close look at the report and see how the company’s doing according to the analysts. First of all, you may be wondering if anyone is still using Second Life at all. The answer is yes, and users are very active on there. During the past 30 days, one million users logged in, according to Second Life’s own statistics. 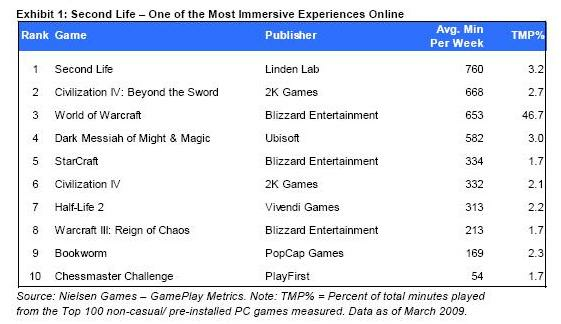 In average time spent per user per week, Second Life in fact trounces all other MMORPGs, including World of Warcraft and Civilization IV. In another testament to the service’s apparent stickiness, the number of hours users spend on Second Life has been increasing steadily and is currently at historic highs, totaling approximately 124 million hours in the first quarter of this year. More importantly, Next Up says in-world transactions have recovered after a significant drop in September 2007 – when gambling was banned in the virtual world – and has been steadily increasing ever since December 2007. Which brings us to the valuation, or at least the estimated value Next Up claims Linden Lab is worth after running a couple of calculations. 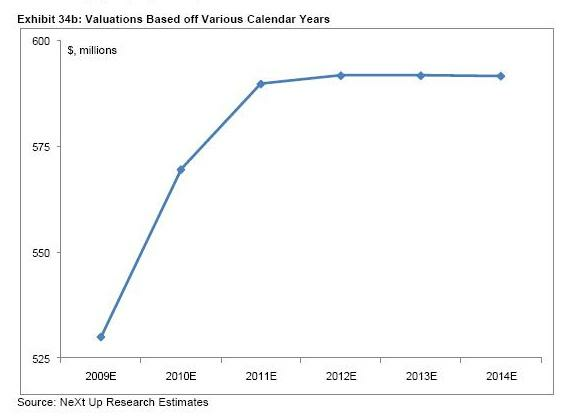 Using publicly-traded online gaming companies as a proxy, Next Up pegs the median enterprise value (EV)/ Revenue multiple for that group at 7.2x off of 2009 revenues. Subsequently applying this self-proclaimed “conservative” multiple of 7x to the estimated revenue of Linden Lab ($100 million for this year), the current target valuation amounts up to $700 million. That seems like a stretch. In November 2007, the last time we asked ourselves how much Second Life is worth, we came out somewhere between $500 million and $1 billion. The current estimated enterprise value calculated by Next Up falls pretty much right into the middle of that range. Next Up defends the 7x multiple variable by referring to a two-year-old M&A deal. When Disney acquired Club Penguin for $350 million in cash back in August 2007, it paid out at least a comparable multiple based on Vlub PEnguin’s projected revenue for the year (between $50 and $65 million), despite the fact that it reaches a narrower demographic profile. But things have changed since then: stocks have tanked, valuations have dropped, the IPO market has pretty much dried up and VC-backed liquidity is at a record low. So that implies a major discount, with a valuation between $300 million to $500 million, which is decent but not spectacular, assuming Next Up’s revenue projection is accurate. – the aging population of its main target markets (U.S. and Europe) and less of a presence in developing nations where its main target audience (people from 13 to 45) is quickly gaining in size. If you’re interested in the virtual worlds or Linden Lab in particular, there’s a ton of information and speculation about the market to be found in the report, even if we focus mostly on the financial side of things. 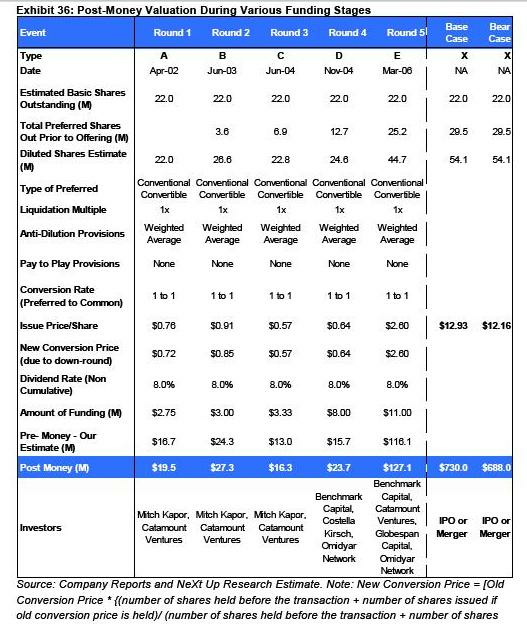 To conclude, here are two charts from the report, one on the estimated valuations based off of different calendar years and one on the post-money valuations after the various funding rounds raised by the company.